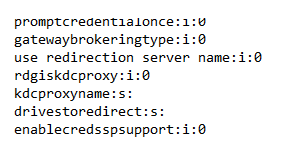 One of our clients reported a problem regarding the change of expired passwords through RDP connection. Some users are connecting to jump stations and they do not have any other access to local company resources. 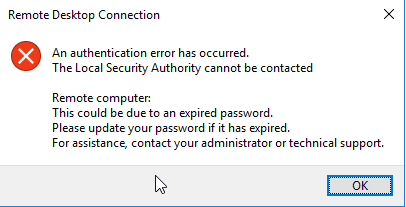 Once the password for a domain account expire those users do not have the option to change the password via RDP connection. An authentication error has occurred. The Local Security Authority cannot be contacted. To be able to fix this I had to lower down security on one of those jump stations so users are able to change the password only on one jump station. Users will also have to change the .rdp file with instructions below. After that, they will be able to normally connect to other jump stations they have access to. Now, go to the destination server/jump station and do the following. Note: The path used is for Windows 2008 server. On other Windows Servers, it might be slightly different. Change the Require user authentication for remote connections by using Network Level Authentication setting to Disabled. Close the policy editor and try to connect again. Users should now be able to change expired passwords through RDP connection.